To view our current inventory of hand bearing compasses, including a like new Sestral, click here! Presented is a Sestrel hand bearing compass originally designed and made by Henry Browne & Co., Barking, London England who was followed by Lilley & Gilley around 1975 when they purchased the Henry Browne assets. This compass is arguably the finest of its type ever designed as a hand bearing device. The bowl is made from cast bronze, and can be polished to a high luster. The optical glass prism magnifies the image, and allows the user to see both the object being sighted and the compass card bearing at the same time. An iridium chip beneath the card was used to light it for night use and needs replacement. A penlight flashlight is a good alternative. 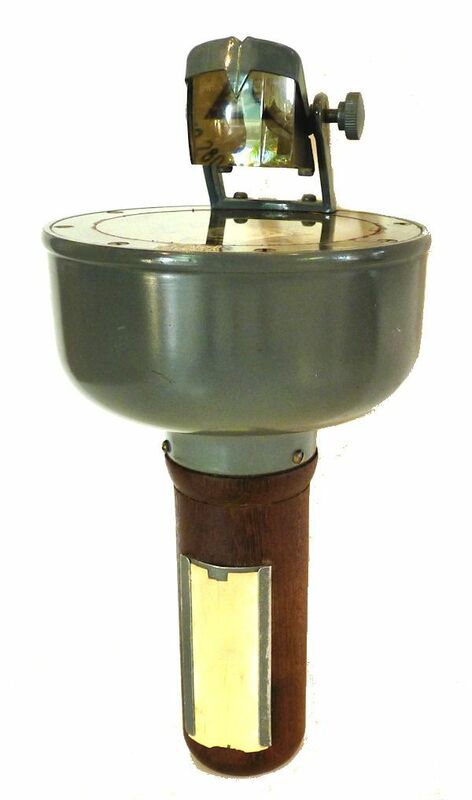 The compass is mounted on a solid teak handle with attached card to make notations, and at two pounds, has the heft and feel of strength and durability. 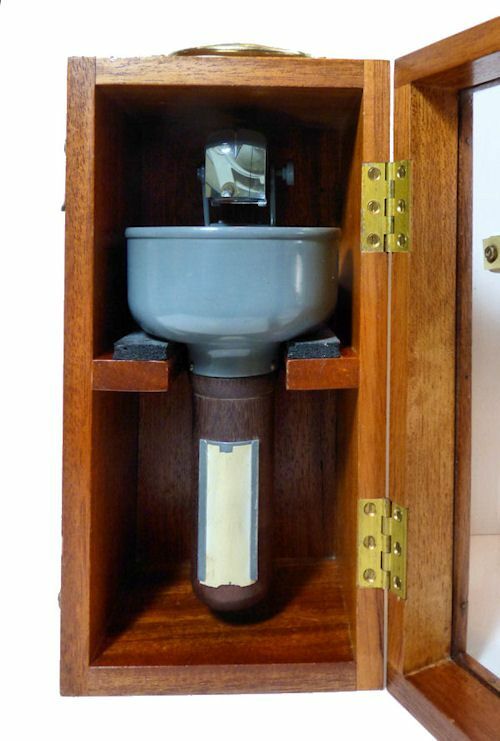 The unit is housed in an expensive teak wood case with clear panel so if mounted in a fore and aft direction, the ship's heading can be seen at a glance. The entire rig is good looking enough to appeal to a collector or in a room decorated in a nautical fashion. Both case and compass show very little evidence of use considering their age and service at sea. BRIEF HISTORY: Henry Browne & Son made only the highest quality marine navigation gear under the "Sestrel" trade mark and were considered one of the finest makers of marine gear in England. They were purchased by Lilley & Gillie around 1975 when the marine industry was being consolidated. The Sestrel operations were sold more than once. Today, there are reproductions on the market and out right fakes. But even the best of the reproductions like those made by SIRS Navigation Company in the UK do not have the fine quality of those made by Henry Browne & Son and later by Lilley & Gilley. The SIRS compass currently sells their version under the Radiant brand in the United States for over $1333.00 with an inexpensive plastic case. CONDITION: The two inch compass card is clear and sharp and the prism magnifies its size to the equivalent of 5 inches. It works like it should, and everything is in good condition considering its age and use. All the brass work has its original bluish grey paint scheme except for one small missing patch of coating at 3:00 o'clock. There are no bubbles or dents, but the fluid information decal has some loss and has yellowed with age, and the radium chip needs to be replaced. The Teak wood case is in excellent condition, but shows some minor light scratches, mainly on the back. The white plastic notation plate on the handle is in good condition, but is chipped at the bottom. STAR RANKING: This instrument shows some very minor signs of use at sea, but still is in fine condition and ranks 5 Stars. Rarely do you find a piece of old gear in such great condition. A superior addition to any collection or use it at sea.